"El dia de Reyes" is a big day for me and my family. I was blessed with the privilege to preach during this feast. As you can see my childhood memories are a bit different that those of the average person. I hope you like the message. Today we celebrate the Feast of the Epiphany; before we go ahead and explore the meaning of the star and the three wise men. I think it might help if I tell you a bit about how I grew up celebrating this feast, or as I call it “El dia de reyes”. In Puerto Rico, and in fact in most of the Spanish speaking world, the feast of the Epiphany is the third most important feast of the year, right after Eastern and Christmas. As a matter of fact when I was a kid this was the day in which my sister and I received most of our presents, yes St Nicolas will show up on Christmas Eve, but Epiphany… That was the big one! Even today the three wise men make a quick stop in my house for some well deserved rest in their way to Bethlehem, and they always leave some small token of appreciation for our hospitality. When I was growing up (and still today!) people would throw these huge parties called “Promesas” in their homes. When I say huge I mean parties that would last 2 or 3 days! During this time there was much food, music and dancing going on, however every 3 hours the music and the dancing stops and everybody gathers together to pray the Rosary. You might be thinking “who in their right mind would go through the logistic nightmare of organizing a three day party in their homes, right after the Christmas Season?? ?” What will motivate someone to do this? It wasn’t until I was going to “Deacon School” that I understood a bit about why people do this. These lavish parties, all the planning, effort and energy are just the outward expression of a deep desire to share in the experience of these three mysterious men from the East, as they followed a star. A desire to be there when they encountered the Christ child and to bring with them the best gifts they could muster. The people that organize the “promesas”, see themselves as companions of the three magi. These three men were the first non Jewish people to recognize Jesus as the son of God and the King of Kings. They were not like the shepherds who had an angel or Herod which had the priests and prophets. The three magi had nobody to tell them about the birth of the messiah, what they had was the willingness to look for God’s revelation in their lives. After this it did not take them long to figure that the shining star they had discovered in the darkness of the night will guide them to a marvelous event: an encounter with the true God, Emanuel, God in the flesh. In a dark world they looked up and saw a shining start and decided that it was worth leaving everything behind to follow. Today, in the world in which we live, it is not difficult to see ourselves as companions of the magi too. Just turn on any news channel and you will know what I’m talking about. There is a lot of darkness out there. If we see ourselves a companions of the magi, then the star becomes the sign of that which brings light into this dark world, that which guides those that are willing to look up for a source of truth. If we accompany the magi, then it is fair to ask my brothers and sisters: What is our star? The answer to this question is simple: Our star is the Church. It is the light house; the compass and the guiding post that points towards the place where we can encounter the source of the truth we are seeking, in this dark world in which we live. Now… I ask you… please… do not miss-understand me here, when I say that the star is the Church I do not mean just, the bishops, priests, deacons and religious. Yes… all these are part of the Church but that is not what I’m talking about. When I say that the star of Bethlehem is the Church what I mean is that the star is the teachings we have received from the apostles though the Holy Spirit, as well as the teachers that for two thousand years have been refining and communicating this truth to a world in darkness, Yes I’m talking about the Popes, the bishops, priest and deacons but I’m also talking about our very overworked religious education teachers, RCIA team members, bible study leaders, youth ministers, peer ministers and on and on… The star of Bethlehem represents all these people that regardless of persecutions, troubles or scandals, for 2000 thousand years have devoted themselves to passing and witnessing to the faith of the apostles and the Gospel of Jesus Christ in a generation which has always walked in darkness. Those of us that have received these teachings and try to follow them are like the three wise men Gaspar, Melchior and Balthazar, which kept their eyes fixed in the one signal they knew would lead them to an encounter with the son of God. But do not listen to my words just look at the words in the Gospel : “Behold The star that they has seen…preceded them…until it stopped over the place where the child was… entering the house they saw the child and His mother Mary.” What does the star do? It guides to an encounter with the incarnated Christ and His Most Blessed Mother. But there is one more thing we need to talk about: What is the reaction of those who are following the star and finally encounter the Lord of Lords and the King of Kings and His most Blessed Mother? Well… they bring three things, First they give Him their Gold: they place their resources of time and treasure at the service of the Son of God; they give him frankincense: they recognize Him as the one true God and they give him the worship that only He deserves, and lastly they give him a spice used in funerals, they give the incarnated God their whole lives, to the very last breath! I pray that you may have a joyous journey following the star of the one living God. 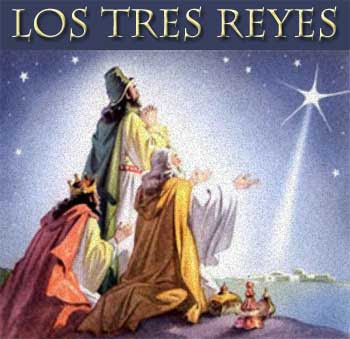 And my brothers and sisters… “Feliz dia de reyes” !